My assignment this week was nougat de Montélimar, a favourite sweet treat from childhood but more recently, from both pastry school and our trip to France. This traditional Provençal confection is full of almond and pistachio nuts, cemented together with very dense Italian meringue cooked with sugar and lavender honey. Different dried fruits or citrus peel can be added for variety. 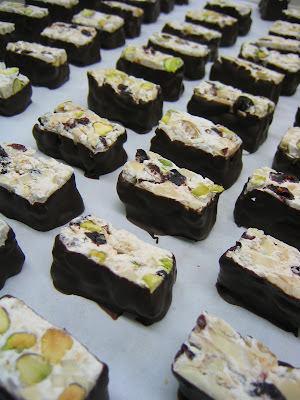 When set, the nougat can be cut into small pieces or long slabs to enjoy; to prevent drying out, it should be wrapped tightly or enrobed partially in chocolate. My sister and I have vague recollections of how my mom would give us small silver-foil wrapped cubes of white nougat when we were young. During pastry school, my love of nougat was reawakened! 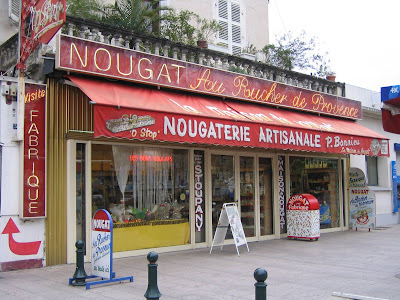 As a result, our recent trip to France included a mandatory pilgrimage to Montélimar, the birthplace of nougat, where we spent a few short hours browsing the countless nougat shops before catching the train to Lyon. Interestingly, nougat de Montélimar must officially contain either 30% almond or 28% almond and 2% pistachio, and honey must be 25% of the sugar content. 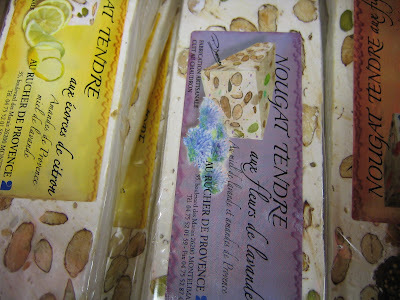 My recipe from pastry school produces a fairly chewy nougat, whereas in Montélimar, both "tendre" and "dur" were available. The first time I had table-side Crêpe Suzette was in a fine dining French restaurant within the Cleveland Clinic campus in Cleveland, Ohio during a fellowship interview lunch. Almost four years later, my accomplishments now include making over 360 crêpes in less than three hours. I have never been keen on culinary endeavors and toiling in front of a hot stove; however, I now understand the fun and, dare I say, rush, of having multiple pans quickly flying over the flames while doing the proverbial culinary "dance". With two crêpe pans cooking side by side and no tool except for my fingers for flipping, I was pleasantly surprised by how much I enjoyed the exciting, albeit sweaty, experience in front of the stove. By carefully controlling the intensity of the flame, the speed of crêpe production is determined as both pans are used simultaneously and without interruption while being careful not to let either crêpe become too brown. 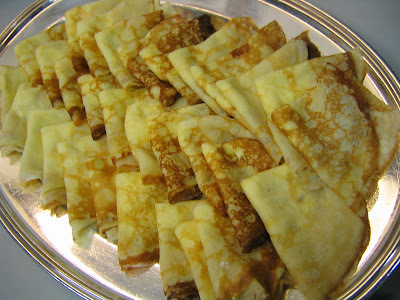 Of course, the expected turnover time for about 400 crêpes by an experienced pastry cook is two hours but I was slower! I never thought that some of the most important lessons I would learn from my Pan Pacific practicum would be about fruit. 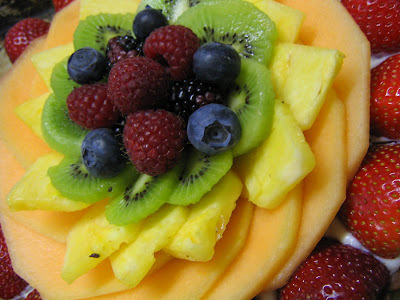 The pastry kitchen uses case after case of fresh fruit every day, for tarts or flans, decorations on plated desserts, cakes, platters, and smoothies for example. Cutting fruit is not difficult per se; however, cutting fruit fast and properly is the goal. My knife skills have improved vastly during my practicum and Chef Ted has imparted on me a greater respect for the natural beauty of fresh fruit. Halving and quartering strawberries with only a paring knife in my hands (without a cutting surface) is now routine and fast for me. Dismantling a pineapple is now an easy 20 second task. Considering the ultimate destination and time to consumption of the fruit is also important. For instance, if your 150 strawberry halves are destined to stand erect on a plated dessert, the green stem needs to be cut flat across; however, if your strawberry half is for a fruit kabob, it is more important to conserve as much fruit on your strawberry, so make a smaller V-cut to remove the stem. When producing fruit flans, the thickness of your melon or pineapple slices must be not too thin because they will dry out before they are glazed and served hours later. But if too thick, the flan is not as aesthetically pleasing. Even minor things like, should a cut strawberry neighbour a cube of pineapple on a bamboo skewer for a fruit kabob, must be considered. The answer is no because the pineapple will soon be stained pink. There are numerous "pearls" of knowledge that I am lucky to have learned and will hopefully retain as I continue in my new career. Undoubtedly, there is such depth and breadth of pastry knowledge in the Pan Pacific of which I have only caught a glimpse during the past several months. I hope that the education will continue as my professional life expands beyond my practicum days. Since returning to my practicum on Sunday, I have realized that although I have resolved many negative anxieties and feelings concerning my departure from ophthalmology, I still have very deep emotions attached to the huge decision which I made over two years ago. This realization occured because yet another person at the Pan Pacific asked me "why did you leave medicine, are you crazy?" and my response was a combination of irritation, defensiveness, and tears. Unfortunately, finding the right words to summarize such a massive, life-changing, and tortuous decision to a total stranger who is not in medicine is next to impossible (and unnecessary, in my opinion). The good news is that despite such repeated assaults to my ego, I am happy to be back in the kitchen after a week of caring for my wheel-chair bound mom. During the month of May, my goal was to learn how to run the "Sauce station" which is basically responsible for all the non-cake and non-baked items, such as pastry cream, sauce Anglaise, fruit products, ganache etc. Becoming more independent was certainly a confidence booster and allowed me to experience the pressure of production. For my last month, I will switch to the "Cake station" which requires more skill and speed. Meanwhile, Chef Ted taught me spherification techniques several weeks ago and I never managed to write a post about the experience. 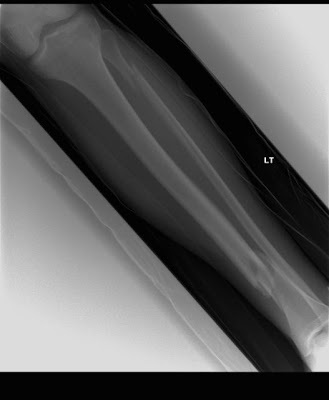 It was a strange flashback to a combination of part chemistry lab and part anaesthesia rotation, using sodium citrate, calcium chloride, and sodium alginate solutions and multiple syringes. Spherification was developed at the famed Spanish restaurant, elBulli, and involves using chemicals to create a thin membrane around a fluid centre. 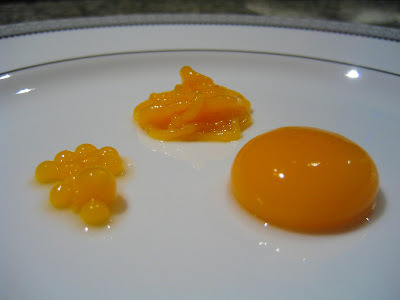 Different size drops or streams of fluid, for example mango purée, will produce a variety of shapes resembling caviar, an egg yolk, or spaghetti. I had a blast.